Some images below courtesy of Chocolette! While at the Kensington Market today, I happened upon Colette's Chocolette! Patisserie. The first and last time I had seen Colette was at the Out-The-Back Market - Tecoma, last month. This time I made sure I got around to tasting some of her macarons, seven different flavours in fact. They were absolutely heavenly with their light crispy texture on the outside and chewy fillings full of flavour. Shared with my daughter, they were gone in a jiffy. The flavours that flew past my lips and danced in my mouth were pistachio, salted caramel, blueberry cheesecake, rose-raspberry & lychee, teh tarik, mocha & red bean and vanilla & raspberry jelly. Colette has had her macaron business for the last two and a half years. It came about when she tired of working 80 hours a week for four years as a pastry chef in South Yarra. Having studied food science at RMIT she was always interested in baking. After a much needed holiday for 3 months in Malaysia where Colette hails from originally, she came home to put her 'sweet ideas' to work. 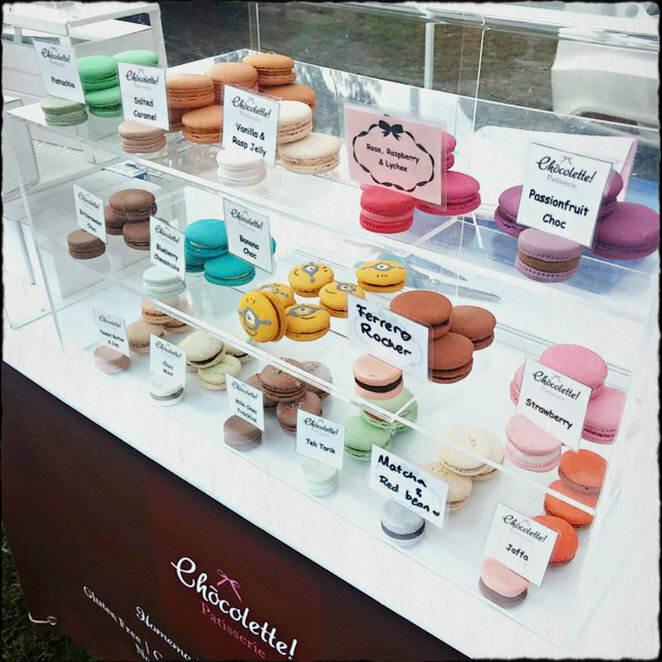 She sourced the markets and found that there were cake stalls and sweet stands out there but no one was doing macarons at the time; around three years ago. Her very first venture was at the North Melbourne Community Market. 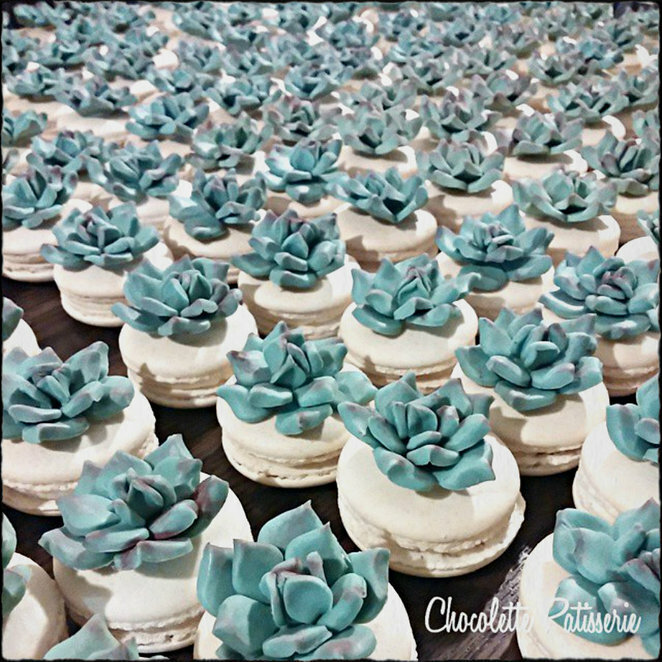 She made 700 macarons and sold out! Her next market was the Mulgrave Farmers Market and since then she picks and chooses which markets to attend now that she's got to know her clientele. Colette doesn't use artificial flavours and she sources her ingredients locally. 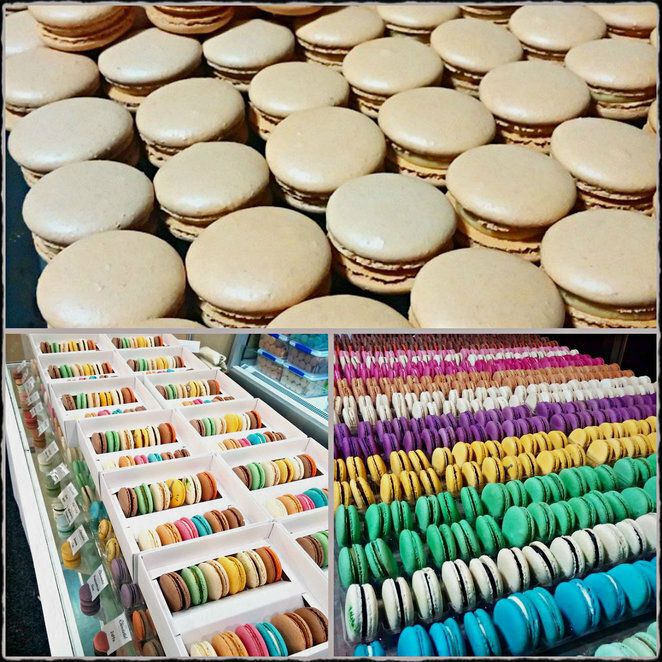 Her macarons are all gluten free, unless otherwise stated. She raids her parent's garden regularly for fresh fruit and herbs which she uses in her macaron recipes. She makes limited edition flavours and is always experimenting with new ones. Her macarons aren't as tall as you'd expect because the shell is reduced in sugar by 15%, but the flavours sure pack a punch. She sources her food colourings from France and her natural food colouring (which is available for customised orders) comes from America. They're made up from ingredients like purple carrot, beetroot and so on. The standard 16 flavours Colette has on hand are salted caramel, strawberry, choc mint, passionfruit choc, vanilla and raspberry jelly, peanut butter and jam, blueberry cheesecake, rose raspberry & lychee, bittersweet choc, jaffa, pandan kaya, banana choc, pistachio, milk choc freckles, durian and special edition. Her special editions are sometimes influenced by her background or her travels. The 'teh tarik' for instance has a filling of Assam tea from Sabah, Malaysia and a combination of condensed milk and caramelised white chocolate. I can assure you it's delicious. This year she's been busy with the Melbourne Cake Expo in March and the Good Food and Wine show, baking 4000 macarons at a time being standard. According to Colette, macarons can be kept in the freezer for a month and that freezing it will not compromise its texture or flavour. She'll advise you how to store it to achieve this success and this knowledge comes in handy when you're preparing for a big event and just don't have the time to go pick it up on the date. 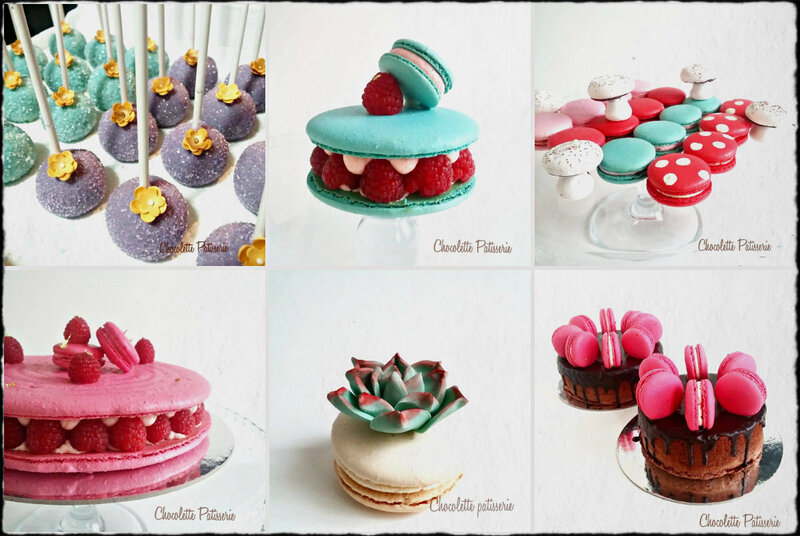 She custom makes macarons for parties, celebrations, special events, corporate functions, bombonieres and so on. 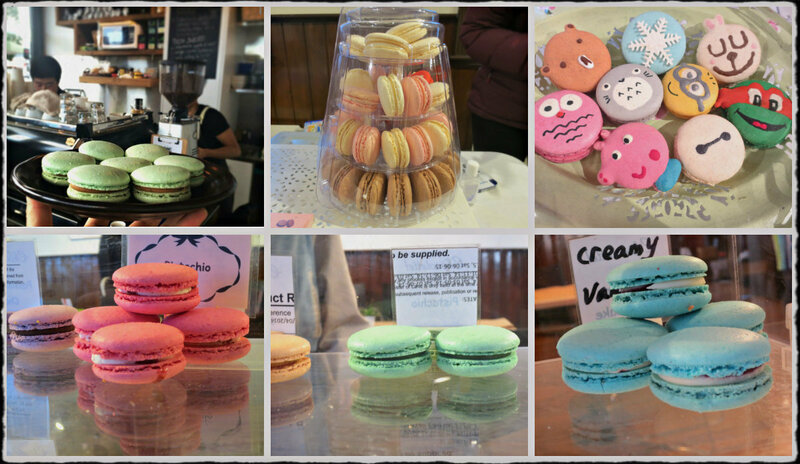 She also wholesales and has her macarons at outlets like Black Flat Coffee Brewers in Glen Waverley. Ideally she'd like to wholesale to boutique stores. Make sure you 'like' her Facebook page so you know which market she'll be at next. She also runs little competitions and such like on her Facebook page which makes it interesting. She has a website that's being updated and should be ready to fly around August coming. 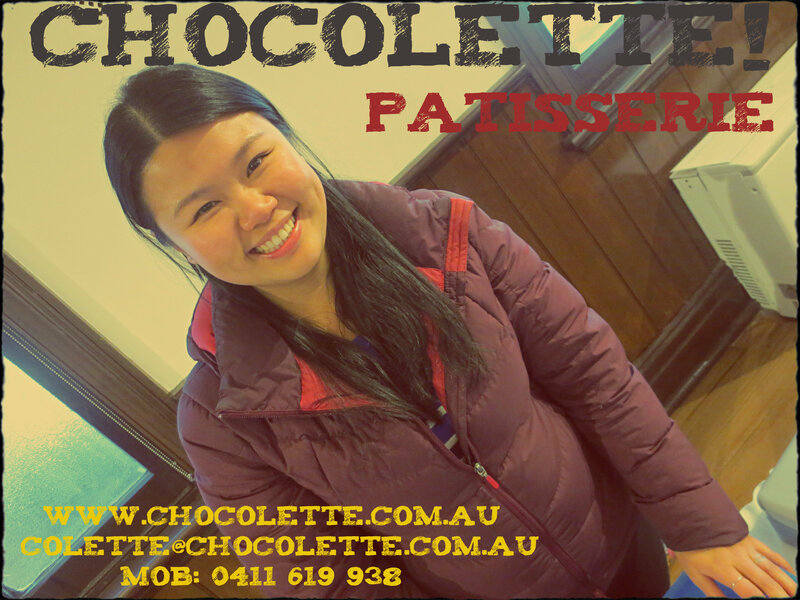 You can also follow her on Instagram: #ChocolettePatisserie. You can buy macarons directly from Colette at any time. Just make sure you give fair warning for large quantities and special events. Don't miss out on these delicious delights. Seek them out and hunt them down I say! Why? Delicious delightful macarons. Find them at markets, food shows and boutique cafes or order directly in larger quantities for special events and occasions. Where: At markets, food festivals, food expos etc. Order directly as well.